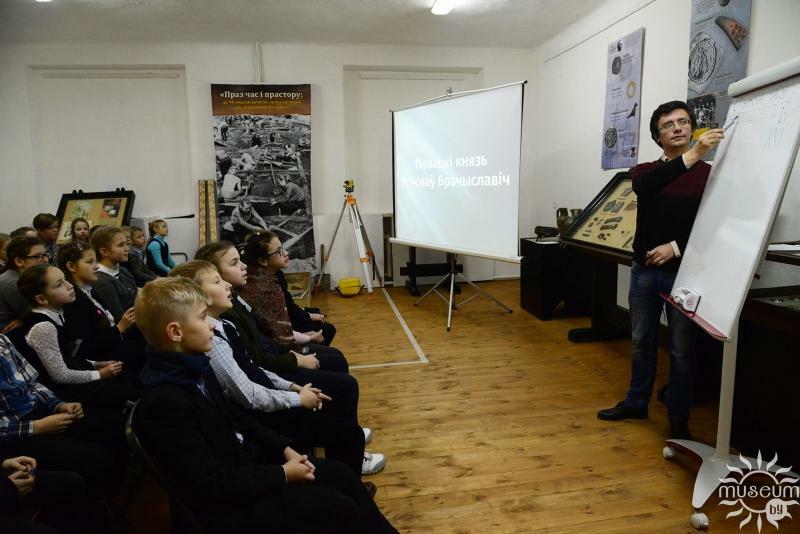 On the penultimate weekend of November the Museum of Local Lore was visited by the pupils of Polotsk schools that at the next museum pedagogical sessions to get acquainted with one of the most famous sons of Polotsk - Prince Vseslav Brachislavich. Students learn why for the Polotsk Prince Vseslav stuck the nickname "Wizard", what significance for our city was the construction of St. Sophia Cathedral, which inherited the prince left the sorcerer to his descendants. With the help of video pupils could briefly "Move" in the times of Polotsk Vseslav and implement a "walk" through the streets of the ancient city. Students not only listened attentively and answered questions of the museum staff, but also actively participated in the "Chamber of Polotsk". And also able to decipher the inscription on an ancient rings and have proven to be real archaeologists during a search of things, which the inhabitants of Polotsk used in the 11th century. The interior of the exhibition "Through time and space", on which classes are held, helped to create atmosphere travel to the past.